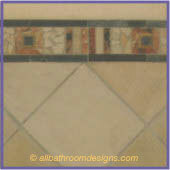 Exquisite bathroom tile designs can come with an exquisite price tag! 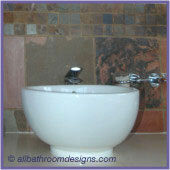 However, there are many ways to use these beautiful tile creations in your bathroom without breaking the bank. 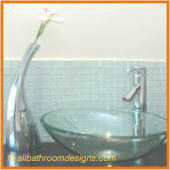 In fact, not using designer tiles all over the place can emphasize their uniqueness and beauty. 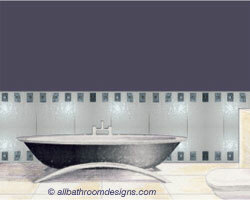 Let's enjoy for a moment a couple of examples, before we get to using them in your bathroom design and layout. 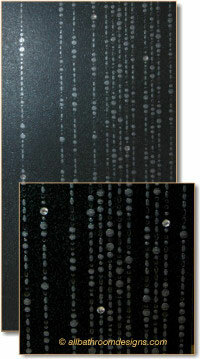 A magnificent example is this matt black ceramic tile embedded with Swarovski crystals. A droplet design is glazed on the tile, creating a beautiful play of light when viewed from different angles. It is the scattering of the crystals though that immediately catches the eye and makes such a powerful design statement. You could of course use this tile on all your bathroom walls for a dramatic effect: Midnight black with starbursts of light caught in the crystals and glazing. Or, use them in focal areas only as we will show you lower down on this page. 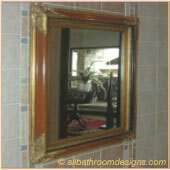 In a small bathroom you could even use them on one wall only - pretty much as you would do with a mural - with no need to repeat them elsewhere. To make them really stand out (pun intended), add dimension to the wall - either in the shower, above the vanity or as splash back for the bath. Just take a minute and head on over to our Red Bathroom page. 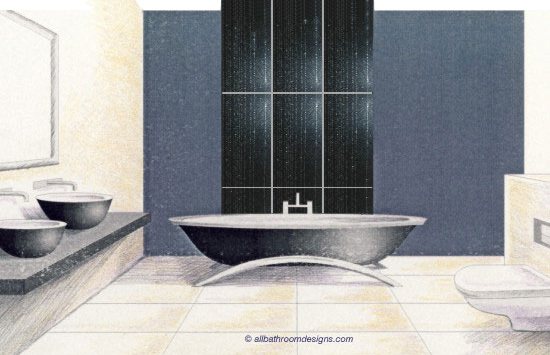 Take a look specifically at the images where we illustrate the addition of architectural/dimensional features to see if you can implement those in your bathroom design. 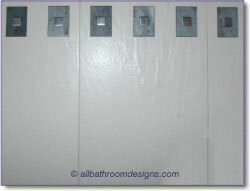 A large white wall tile gets the custom treatment with inlays. A stainless steel mosaic tile is inlaid into a charcoal tile, inlaid into the white tile. With water-jet precision-cutting a professional finish is achieved and the design possibilities are endless! You can play around with glass bead or mosaic inlays, using a thicker tile as inlay to add texture and dimension ... in fact, once you start looking at various materials with a different eye, the fun will really start. You can use this type of bathroom tile design as a broad accent strip, especially if you use them end-on-end, making a break away from the often used narrow off-the-shelf accent tile strips. The area surrounding this feature tile can be finished with standard (and less expensive) tiles if you wish. Or, a simple paint finish - which can be changed from time to time - will also offset your unique tiles beautifully. To assist you with planning your special tile positions, print out photographs (black and white will work just fine) of you bathroom walls and draw/shade in your intended focal areas. Tiles are an important bathroom design element and should serve more than just the practical purpose of cladding your bathroom floor and walls. 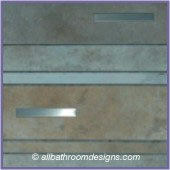 Take a look at our page on Bathroom Floor Tile where we illustrate the use of designer tiles on floors. We hope the bathroom tile designs featured here will inspire you to get creative with some exciting bathroom tile ideas of your own!